Mysterious killer slices up old man in a cabin. Obnoxious couple that is so annoying they’re actually made for each other visits cabin because spending time alone together with nothing to do somehow seems like a good idea. Killer sets his sight on couple and decides the world would be better off without them. Sound familiar? It should, because it’s the same old story that’s been done a hundred times before, and is the premise here again in The Cabin. Directed by Johan Bodell with a script from Erik Kammerland (Douche), The Cabin is more specifically about couple Harry (Christopher Lee Page) and Rose (Caitlin Crommett), a pair on the brink of being one more fight away from a murder-suicide. They arrive at a cabin owned by Harry’s family, where they meet Sven (played by Kammerland), who turns out to be just as crazy as he is awkward, and sets out to slice and dice the unhappy couple. I don’t mean to be so harsh in describing the plot as something which is completely unoriginal, I just have a hard time deciphering what it is that inspired the filmmakers to tackle this cliché-ridden project. 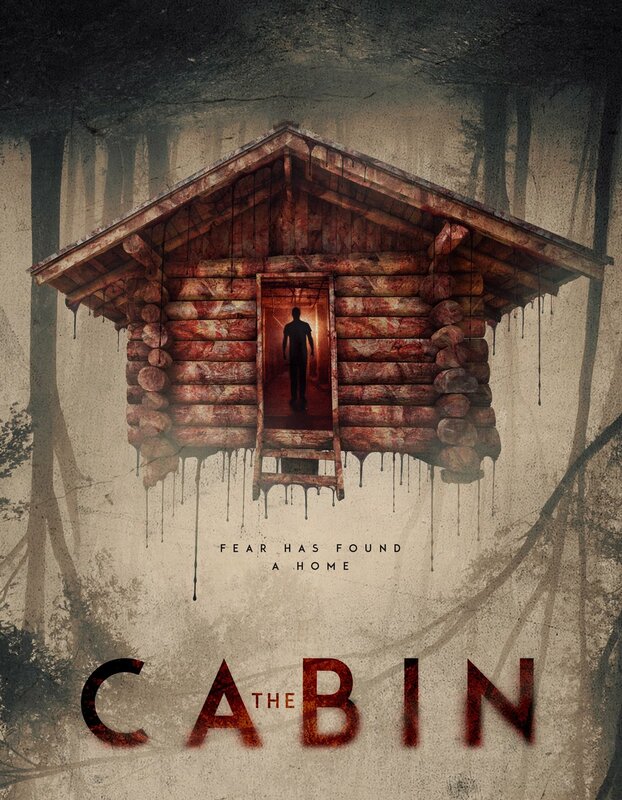 Watching The Cabin is like being at a party, cornered by a stranger telling you a story they heard on the news, in great detail, but it just so happens you’ve already heard this story, and you’re doing your damndest to be polite and listen, but said stranger is taking forever to get to the bloody point. It all starts with the tone. The Cabin begins with an excellent opening that demonstrates Bodell’s ability behind the camera. Atmospheric, tense, and horribly dark, the film introduces us to Sven, decked out in an insanely creepy old man mask, as he indulges in a little rage-a-hol with an even older man (Thomas Hedengran). Cinematographer Charles Doan does a great job setting the scene with eerie lighting and unnerving imagery. It’s the sort of opening that excites horror fans, because it gives viewers the sense that we are in for what could possibly be a terrifying slasher film, with a memorable killer thanks to a well-crafted mask. Turns out though, that is not at all the type of movie which we are forced into during the remaining eighty minutes. Instead, we’re “treated” to what boils down to a couple’s therapy session which is about as exciting as waiting for the turkey to bake on Thanksgiving, and leaves you just as hungry while you impatiently try not to keel over from bored starvation. This is not, in any way, shape or form, a slasher, and contains a surprisingly small body count. And yes, I understand The Cabin is not meant to be a pure slasher, but when you throw in such a perfectly designed mask as the old man prop, it feels like such a waste to see it go unused. That’s right, despite the killer’s expert taste in murder-spree wear, we actually see very little of him in it. No offense to Kammerland, but his performance while unmasked doesn’t exactly strike fear into the viewer, and is rendered silly by some kind of bark/roar which he utters every now and then out of rage or excitement for the kill, who knows. To make matters worse, Harry and Rose are some of the least endearing characters I’ve had the displeasure of watching all year. Out of respect for Kammerland and the rest of the cast who worked hard to make this film, I don’t want to throw this on any one person in particular, as the couple’s presence seems to be a combination of poor delivery and dialogue. These two rip and tear at each other so much, especially Rose, that it’s impossible to like either one. Page and Crommett frequently share a sly grin while insulting one another, just before exploding into shouting, that I never could quite tell when the couple was casually joking around or actually trying to hurt each other’s feelings. The chemistry between the two is so mismatched, that if they were actually chemicals combined in a lab, they’d likely create a deadly gas with a stench worse than the foulest of C.H.U.D. hanging out in the New York sewers. The Cabin is all about Rose and Harry’s struggling relationship, so these arguments aren’t exactly out of the ordinary, and would normally be okay, except the two spend so much of the film’s short run-time separated or inexplicably splitting up with the worst possible reasoning, that the viewer is robbed of any opportunity to really get to know them as people who DON’T hate each other, making it harder for us to want to see them make it out of this alive. In horror, the viewer needs to be endeared to the characters so that we care when the mayhem begins, but I often found myself thinking that Sven is actually the best thing that could have ever happened to them, because these people are so miserable that a happy life, unfortunately, does not appear to be in the cards for them. To put it simply, Sven is actually giving each of them what they want, whether they realize it or not. As The Cabin came closer to its depressing finale, I found myself believing that this film could have been so much more, because the final cat and mouse game between Sven and the desperate couple does finally get the blood pumping, but it’s too little too late to save what is comparable to one of those art pieces you’ll see at an art show, which is simply a giant canvas painted black. I’m sure there’s a point, but I have no idea what it is. Kammerland’s script leaves the audience with hardly an ounce of what you could call a “character arc”, leaving me to again argue that at least one member out of the Harry/Rose pair gets exactly what they wanted without having to do anything themselves. I shouldn’t be leaving a horror film in which people died thinking “good for them”, but alas, here we are. If you enjoy films which are essentially eighty minutes of character’s hiding and viciously fighting, then The Cabin might be up your alley. Otherwise, I would recommend vacationing far, far away from this cabin by the lake. Or maybe check out that gingerbread house nearby in the woods. I hear the old lady there is known for giving out free candy. Now that’s exciting.